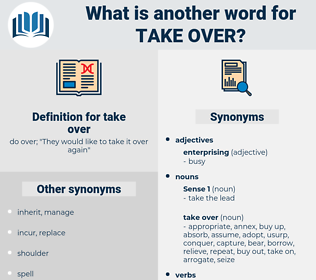 What is another word for take over? do over; " They would like to take it over again"
lethargic, unenthused, unadventurous, cowardly, unresourceful, passive, timid, unambitious, meek, inactive, unimaginative, lazy. ineffective, apathetic, impotent, moderate, idle, unforceful, weak, mild, feeble. easy, indifferent, helpless, unenthusiastic, fragile, dispirited, dull, facile, delicate, sluggish, unhealthy, soft, infirm, enervated, incapable. discard, neglect, leave alone, oppose, disagree, repudiate, renounce, return, repulse, disapprove, refuse, give, deny, let go, disallow, disown, release, reject, shun. disconnect, sever, loosen, divorce, separate, divide, unfasten, leave off, detach, leave out, disunite, disjoin, Unlink, take away. bestow, bequeath, keep, pay, receive. doubt, complete, end, not believe, not take, offer, not do, finish, conclude, let alone, leave. give up, countermand, reverse, revoke, contradict, help, submit, start, permit, assist, mismanage, obey, surrender, aid, retreat, advance, serve, recall, free, abandon, encourage, allow, lose, yield, follow, comply, consent, liberate. ignore, unwrap, uncover, reveal, lay out, disregard, forget, lay bare. engage, stay, retain, hold, hire, accept, employ, welcome. lack, abstain, need, scatter, share. forsake, not have, dispossess, miss. deprive, take, remain, precede, penalize, break, damage, worsen. give in, drop, misunderstand, pass, be immune. burden, run ragged, abuse, use. capture, raid, preoccupy, hijack, conquer, annex, appropriate, seize.